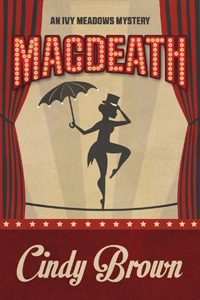 Macdeath by Cindy Brown: Synopsis and Online Purchase Options. Synopsis (from the publisher): Like every actor, Ivy Meadows knows that Macbeth is cursed. But she's finally scored her big break, cast as an acrobatic witch in a circus-themed production of Macbeth in Phoenix, Arizona. And though it may not be Broadway, nothing can dampen her enthusiasm — not her flying caldron, too-tight leotard, or carrot-wielding dictator of a director. But when one of the cast dies on opening night, Ivy is sure the seeming accident is "murder most foul" and that she's the perfect person to solve the crime (after all, she does work part-time in her uncle's detective agency). Undeterred by a poisoned Big Gulp, the threat of being blackballed, and the suddenly too-real curse, Ivy pursues the truth at the risk of her hard-won career — and her life.